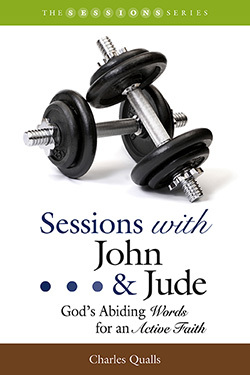 Sessions with John and Jude is a ten-session study unit designed to provide a compelling look at these letters from the New Testament. Each session is followed by a thought-provoking page of questions that allow for a deeper experience of the scriptural passages. These resource pages can be used by seminar leaders during preparation and group discussion, as well as in individual Bible study. Charles Qualls takes readers on a journey through the letters of John and Jude. Shedding light on these important but often overlooked New Testament books, this study will inspire, protect, inform, and challenge our faith lives such that we are not left the same. The lessons of these letters drive us to active belief as Christ modeled. Charles L. Qualls is associate pastor for pastoral care at the historic Second-Ponce de Leon Baptist Church in Atlanta, Georgia. He is a graduate of the McAfee School of Theology of Mercer University, Atlanta (Dmin.). Prior to his work in pastoral care, he served churches in Georgia and North Carolina as an adult Christian educator. Charles has co-authored three other titles for Smyth & Helwys. He and his wife, Elizabeth, enjoy travel, sports, and the written word.